On-par with the excellence of its predecessor, Season 7 opens with a collapsed wormhole, one of DS9’s most beloved characters dead, an escalating war, and Sisko on indefinite leave from Starfleet. Sisko’s mystical origins are revealed, forever tethering him to Bajor. Dukat’s obsession with the Pah-wraiths continues while Kai Winn’s lasting attempts at power pushes her into their grasp. These seemingly unconnected events collide with the 9-episode series finale arc. 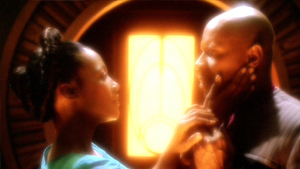 While on leave on Earth, Sisko uncovers a long-held secret after receiving visions of a mysterious woman. An "old" friend makes a stunning return and Kira clashes with a Romulan Senator. Sisko pursues a vision from the Prophets while Kira implements a blockade against the Romulans. Meanwhile, Jadzia’s closet friends ensure her passage into Sto-vo-kor. Ezri Dax helps counsel Garak through his Closter phobia as she adjusts to her new life aboard DS9. Baseball fever consumes DS9 as the crew prepare for an epic, albeit comical, baseball game against an all-Vulcan crew. Odo rendezvous with a defective Weyoun who wants to defect, while Rom helps Miles navigate the Great Material Continuum. Worf convinces a reluctant Martok to grant Kor a command-level position, only to discover that Kor’s best days are far behind him. Under attack by Jem’Hadar, Nog is seriously injured upon visiting a battle-hardened Starfleet regiment. Kira discovers a group of Pah-wraith followers living on Empok Nor, led by an apparently enlightened Gul Dukat. DS9’s crew is concerned when Nog, who appears to be suffering from Posttraumatic stress disorder, seeks refuge in the Vic Fontaine holo-program. Ezri returns home only to discover her family in disarray with possible connections to the Orion Syndicate – a mob-like criminal organization. Quark and Rom deliver a stolen cloaking device to the alternate universe in an effort to rescue Grand Nagus Zek. Ezri awakens the spirit of Joran Dax to help stop a serial killer aboard DS9. Sisko and crew help fictional Vic Fontaine save his lounge from mobsters. While attending a medical conference, Bashir is recruited by Section 31 to secretly examine a Romulan who’s a member of the Tal'Shiar. As Sisko and Kassidy plan their wedding, Sisko receives a painful warning from the Prophets. Meanwhile, Ezri takes it upon herself to search for Worf. Against the will of the Prophets, Sisko marries Kassidy Yates while Worf and Ezri are held captive on a Breen vessel. Dukat continues using Kai Winn to unleash his sinister plan. Kai Winn is enchanted by Dukat, believed to be a mere Bajoran farmer sent by the Prophets, while Worf and Ezri work to escape Breen captivity. Altered to appear Bajoran, Gul Dukat manipulates Kai Winn into studying how to release the Pah-wraiths, while the new Breen-Dominion alliance takes center-stage. Odo, Kira, and Garak help prepare Damar’s group of rebels, Gowron arrives on DS9, and Dukat and Kai Winn continue to study how to release the Pah-wraiths. Amidst much tension, Kira, Odo, and Garak prepare Damar’s rebels while Odo’s concealed illness quickly spreads; and, a bold move is made against Gowron. Bashir and Miles enter the estranged mind of Section 31’s Luther Sloan to find a cure for Odo. With Grand Nagus Zek en route to DS9 to announce retirement, Quark is believed to be appointed his replacement. Meanwhile, an ambushed Kira, Damar, and Garak elude capture on Cardassia. The Dominion War sees a climatic ending while Dukat and Kai Winn release the Pah-wraiths from the fire caves of Bajor.